I did make the Christmas tree last night and it is absolutely adorable!! 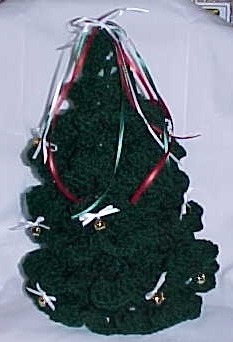 Floral pins or wire to fasten the tree to the styrofoam. Stitches used: ch, sl st, dc, tr. ROW 1: Ch 101, Dc in 4th ch from hook and in each ch across. Ch 5, turn. ROWS 2: Dc in same st as beg ch 5, * Sk next dc, (dc, ch 2, dc) in next dc. Rep from * across. Ch 3, turn. ROW 3: (dc, ch 2, dc) in each ch 2 sp across. Dc in 3rd ch of beg ch 5. Ch 3, turn. ROW 4: (dc, ch 1) three times in each ch 2 sp. Dc in last dc, ch 3, turn. ROW 5: * Dc in next dc, ch 1. Rep from * across. Ch 5, turn. ROW 6: Sc in next ch 1 sp, * Ch 5, sc in next ch 1 sp. Rep from * across. Ch 4, turn. ROW 7: 6 tr in each ch 5 sp. FINISHING: Wrap the crocheted piece around the styrofoam beginning at the bottom of the cone. Position it as a branches would look and pin into place to the cone with the floral pins or wire. Add the bows and jingle bells ramdomly, tie a bow on top or add a star and you're finished.